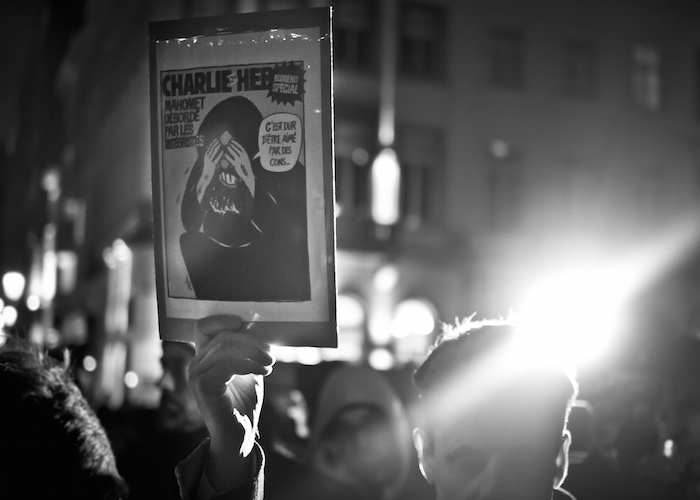 CHARLIE HEBDO: CAN WE LEARN TO UNDERSTAND INSTEAD OF DISCRIMINATE? Visual culture is a demonstration of the changing culture of a group of people–how they operate within the framework of their own history along with influences from outside attitudes and actions. In light of the recent cartoons published by Charlie Hebdo, a French satirical magazine, and their violent repercussions, an analysis of this changing culture is crucial. If art is a way for people to express their self-identification and respond to a global environment, political cartoons are a way for that global world to display an outside identification and stereotype. While this shouldn’t take away from the tragedy of the attack on Charlie Hebdo, when two Islamist terrorists forced their way into Charlie Hebdo offices and murdered 11 people, it does mean these events need to be unpacked and viewed with a critical eye. We shouldn’t let ourselves further stereotype and discriminate an entire religious group based on foreign cartoons and the violence of a few. The history of cartoons using Mohammed’s image dates back to 2005, when a Danish magazine, Jyllands-Posten, published a cartoon of Mohammed as a suicide bomber, with a bomb instead of a turban. This inspired a huge backlash throughout the Middle East. The following February, Charlie Hebdo published another cartoon of Mohammed saying, “It’s hard to be loved by imbeciles.” This not only attacks those who use violence in the name of Islam, but also attacks the larger body of Muslims by claiming that intelligence and Islam cannot be reconciled. Most recently, following the attack, Charlie Hebdo printed a cartoon of Mohammed holding a “Je suis Charlie” sign and saying “All is forgiven”. The cartoon shows Mohammed forgiving both the cartoonists and the Islamists for “speaking on his behalf”. It is clear that the images are disrespectful to Muslims, although the satirical magazine prints offensive cartoons about almost every other group with something to be satirized. What is crucial here, however, is that in Islam, visualizing Mohammed’s face in any way is offensive, as it takes away from the oneness of God. Not only is the basic portrayal of Mohammed upsetting for many Muslims, but these cartoons also completely desecrate their religious prophet. In terms of the violent repercussions of the images, it’s easy to let that one act cloud over all other responses. However, the cartoons also bring about a different set of reactions; they inspired many other Muslims to use art to get their voice heard, and to recreate their identity. After the Danish cartoons were published in 2005, Iran chose the year 2006 to be the “Year of the Noble Prophet”; this inspired a wave of Islam-related art to flow throughout the country. 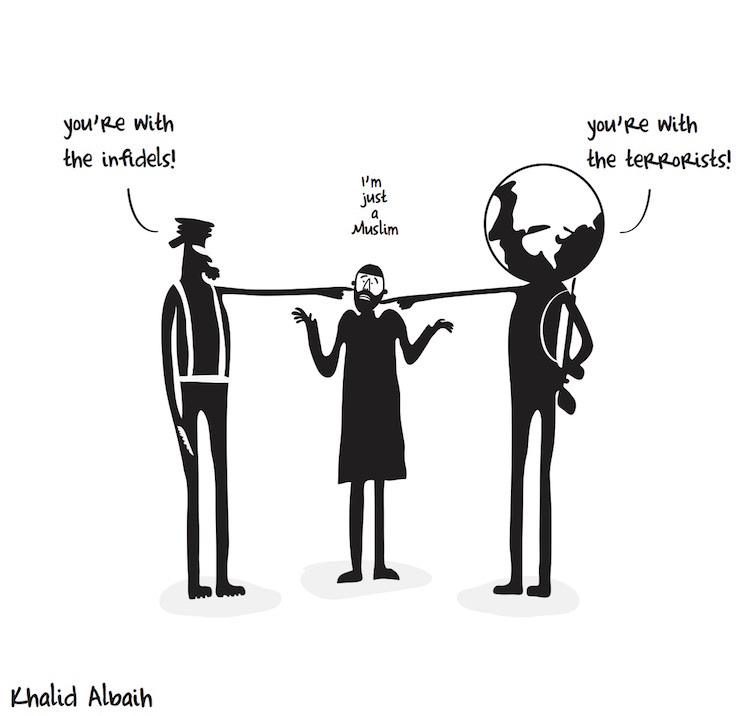 In response to the massacre towards Charlie Hebdo, which resulted in two deaths of innocent victims, many Muslim cartoonists use that same art to unpack their experiences and feelings. It was an attempt to show that they do not identify with the small minority of those who use violence, and to explain the personal effect of the cartoons. This shouldn’t at all lessen the tragedy of the massacre, but it is equally important not to let what happened further stereotype a diverse and often denigrated group of human beings as violent, irrational or terrorists. While this shouldn’t take away from freedom of speech, it is important to look at these images and their repercussions with a critical eye. As a viewer, think about why the image is acceptable in our society, and what that means for the way we interact with members of that group. German art historian Ernst Gombrich describes the political cartoons as telescoping “a whole chain of ideas into one single pregnant image.” This is important, as the cartoons invite us to think, both about the truths and falsities represented, as well as how our culture and history has led us to a place where these conceptions of a faith are represented. Tragically, however, most people do not stop to think and unpack the meanings behind these images. Many see a cartoon of Mohammed as a terrorist and accept it, use it to justify stereotypes and prejudices. So the next time you see a satirical cartoon or other forms of media-enforced stereotyping, stop and think about the environment that legitimizes it and what that does to a group’s identity.